This summer Madison rooftop hosts one of the more exclusive cinema screenings in town with Sunday night cult classics courtesy of Luna Cinema. 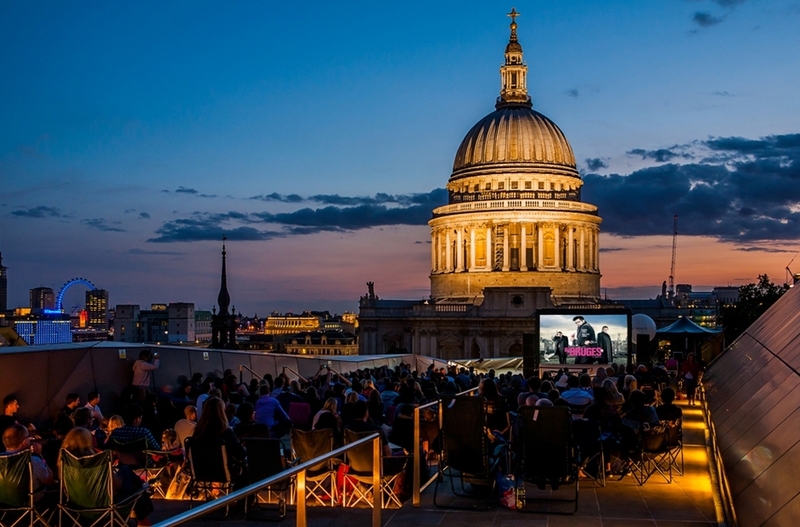 Against the spectacular backdrop of St Paul's, you can see screenings of Birdman, In Bruges and Groundhog Day and enjoy a 3 course movie goers menu and glass of champagne on select Sundays between Sunday 26th July and 20th September 2015. The meal takes place in the rooftop restaurant before the film and there's popcorn, pizza by the slice and Jude's ice cream on offer to sate those cinema cravings. For the final film, shown on Sunday 20th September 2015, it's '80s night when the film is decided by public vote. What are the best dining options near Luna Cinema at Madison London? Luna Cinema at Madison gyms, sporting activities, health & beauty and fitness. The best pubs near London Luna Cinema at Madison. Luna Cinema at Madison clubs, bars, cabaret nights, casinos and interesting nightlife. Where to have your meeting, conference, exhibition, private dining or training course near Luna Cinema at Madison. From cheap budget accommodation to luxury 5 star suites see our special offers for Madison hotels, including Grange St Paul's Hotel London from 86% off.